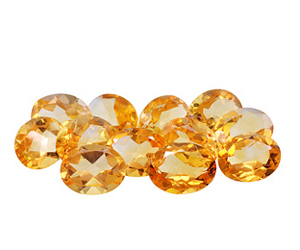 The official birthstone of November, topaz is found in colors of wine, yellow, pale gray, reddish-orange, or blue brown. The name "topaz" is derived from the ancient Greek name of St. John's Island in the Red Sea from which a yellow stone was commonly found. The Greeks believed topaz gave its wearers increased strength while the Egyptians wore it as an amulet to protect against injury. Traditionally only natural yellow, or Imperial topaz was used as a birthstone but in modern times all colors have become accepted. Topaz is mined in Germany, Mexico, Australia, the United States, and the mountains of Russia.